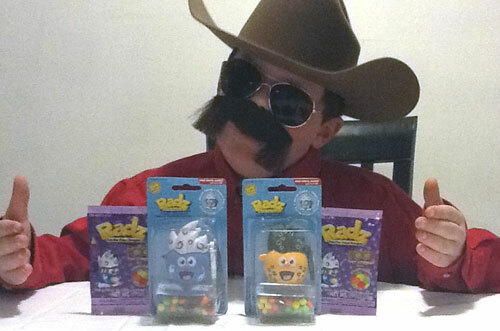 Radz candy dispensers have been one of our favorite review items so far. We had a lot of giggles and really enjoyed the fun little characters. Plus, there’s more to Radz than just the candy dispenser. There is even a whole online world to explore! If you are looking for an Easter basket gift idea, Radz are absolutely perfect! Easter will be upon us very soon! They say that Radz are candy dispensers guaranteed to make you giggle. That is for sure! Watch our YouTube video see how much fun the Bandit has showing you his new Radz! The Radz candy dispensers are just like a toy. My son had so much fun shooting the candy out of the character’s mouth. You can choose from several fun characters like Antic, Bubbs, Critter and Scorch. Each Radz character comes with a pack of candy, a backpack buddy clip, interchangeable hair and a special code to log in to RadzWorld.com. My son had a little trouble twisting the hair cap off at first but with a little practice he was able to master it and quickly reload his Radz candy. My son was really drawn to the backpack buddy clip. He likes being able to clip anything and everything to his backpack. It’s a lot of fun for him to be able to take it places and latch it on to things. He is still talking about that buddy clip. Although you can shoot the candy out of the Radz mouth, you can slowly pull back the top of the hair to dispense. The candy lays in the Radz’s open mouth for your kids to easily grab. 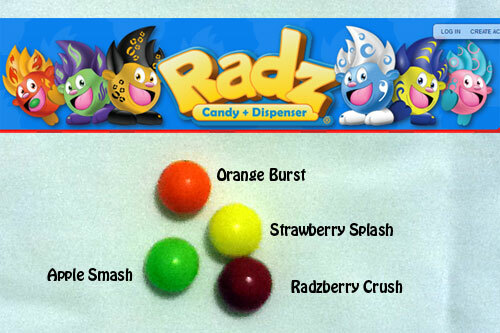 Radz candy comes in four citrusy flavors of Orange Burst, Apple Smash, Strawberry Splash and Radzberry Crush. We thought the candy was really good. My son said it was pretty hard but he really enjoyed it. Plus, the candy treats are peanut-free, gluten-free and kosher certified. Radz is also interactive. You can download free Apps like Radz: ZapTap or Radz: ZigZag. You get a full entertainment experience! You can go online to RadzWorld.com to watch original animations and play games. Each of the Radz characters comes with a code you can enter online. The Radz candy dispensers are for ages 3+ and retail for $4.99. Candy that comes along with other interactive activities and games are always fun, I think. The Radz characters are cute and big, which is nice so there aren’t any choking hazards. The clip on probably makes it easy to keep close and not lose. The mouth dispenser is interesting, I like that it pops right out and makes it easy to grab the candy. I didn’t really see the shooting but I guess that would be fun as long as the candy didn’t get stuck in someone’s throat! These are so cute – I know the kids would love them! What a fun candy gift idea! I’ll have to check these out for my niece and nephew! I love candy dispenser the bad part was when you run out! Thanks for sharing your review. This is super cute! Great easter gift idea! These are really cute. Great Easter ideas. These are so cute! Thanks for the review! Thanks for the review on these Radz candy dispensers, because I’m always looking for cool little gifts for my friend’s kids, that are inexpensive yet entertaining. Not a bad price for a refillable toy that comes with online apps. These are really cute! They are like a modern version of Pez. These are a really cute idea for easter baskets or just for everyday. I have never seen these until now. Thanks for the review. These are really great ideas. I love them and I’m sure the kids would too. I love this idea! Cute! These are great for the Easter basket. Thanks for the review! I love candy dispensers and I think they would be a good item to have for goody bags at birthday parties too — the kids love them.